1Sambalpur University, School of Life Sciences, Jyoti Vihar-768019, Sambalpur, Odisha, India. 2Sambalpur University, Institute of Information Technology, Jyoti Vihar-768019, Sambalpur, Odisha, India. *Corresponding author (drjpanigrahi@gmail.com). The mode of gene action governing resistance to plume moth (Exelastis atomosa Walsingham 1886) derived from pigeon-pea (Cajanus scarabaeoides (L.) Thouars) accession ICPW-94 has been determined and the resistance alleles have been designated as PPM1. The progenies of F2 population and F3 families derived from an interspecific cross C. cajan (L.) Huth ('ICP-26') x C. scarabaeoides (accession ICPW-94) revealed monogenic gene action for resistance to plume moth, and the dominant control by single locus or cluster of tightly linked alleles. Bulked segregant analysis (BSA) of 116 F2 progenies by using 143 parental polymorphic RAPD primers could identify a fragment OPA09910 associated with plume moth resistance in coupling phase of linkage. Further single plant analysis of the 116 F2 mapping population revealed OPA09910 was linked to PPMi locus conferring host resistance to plume moth with recombination fraction (rf) value of 0.125 (12.7 cM of Kosambi function). The resistance specific fragment OPA09910 was cloned, sequenced and converted into a sequence characterized amplified region (SCAR) marker, SCOPA09942, which was also closely associated (10.3 cM) with the locus PPMl with rf value 0.102. BLAST analysis with pigeon-pea genome sequence also confirmed its occurrence in CcLG02 (Scafseq.LG_V5.0fa) and contig 01597 (AFSP01.fsa1). This SCAR marker showed reasonable screening efficiency in the F2, F3, and BC1F1 lines, thus it can be used as genetic handle in marker-assisted introgression of the genomic fragment conferring plume moth resistance and screening of breeding lines in pigeon-pea. Key words: BSA, Cajanus cajan, Cajanus scarabaeoides, interspecific population, linkage mapping, marker assisted breeding. Pigeon-pea (Cajanus cajan (L.) Huth) is a major grain legume crop of the world. This crop possessed a genome of 833.1 Mbp and distributed over 11 linkage groups (Singh et al., 2012; Varshney et al., 2012). The yield of this crop has constrained with various biotic and abiotic stresses. Among biotic stresses, a group of pests feeding on flowers, pods and seeds constitute the pod borer complex are of key concern in the pigeon-pea growing countries (Grover and Pental, 2003; Gnanesh et al., 2011). Pod borer complex comprises of Helicoverpa armigera (Hubner, 1805) (pod borer), Maruca testulalis (spotted pod borer), Lampides boeticus (Linnaeus, 1767) (blue butterfly), Exelastis atomosa Walsingham 1886 (plume moth) and Melanagromyza obtusa Malloch (pod fly), and incurred 30%-80% yield losses in pigeon-pea (Sharma et al., 2010). The pod borer complex was led by H. armigera as major pest by incurring 70%-80% of yield loss, and this loss was well supplemented by pod fly (70%-80%), blue butterfly (4%-10%) and plume moth (5%-10%) in pigeon-pea (Sharma et al., 2010). The host resistance to these pests is not available in the primary gene pool including cultivars and local land races of C. cajan. But, several genotypes of secondary gene pool belonging to C. scarabaeoides (L.) Thouars, C. acutifolius (F. Muell.) Maesen, C. sericeus (Benth. ex Baker) Maesen, and C. albicans (Wight & Arn.) Maesen possessed with host resistance to pod borer (H. armigera) and some of its allied pests including pod fly, blue butterfly and plume moth (Sujana et al., 2008; Panigrahi, 2011). Hence, the genetic control of resistance to these pests have been identified in pigeon-pea using interspecific populations involving accessions of C. cajan and C. scarabaeoides (Verulkar et al., 1997; Aruna et al., 2005; Mishra et al., 2013; Sahu et al., 2015). All earlier workers reported that, resistance to pod borer (caused by H. armigera) is controlled by dominant allele of a single gene. It has also been reported that low densities of glandular long and high density of non-glandular short trichomes were associated with the host resistance caused by H. armigera (Aruna et al., 2005). Similarly, resistance to M. obtusa (Pod fly) was governed by two recessive genes with complementary gene action (Verulkar et al., 1997). Further, Sharma et al. (2003) reported a negative association between pod wasp (Tanaostigmodes cajaninae) and pod borer. No report was available on inheritance of plume moth resistance. The random amplified polymorphic DNA (RAPD) markers (Williams et al., 1990) coupled with bulked segregant analysis (BSA; Michelmore et al., 1991) has been used for molecular tagging and mapping of genes controlling agronomically important traits in various crops including pigeon-pea (Kotresh et al., 2006; Ganapathy et al., 2009; Dhanasekar et al., 2010; Mishra et al., 2013). Recent days, RAPD markers are not favored in breeding endeavors due to its inconsistency in amplification across the laboratories. Hence, the linked/ co-segregated RAPD markers were converted into SCAR marker based on sequence data prior to its introduction in crop breeding efforts. Literature evinced on development good many number of SCAR markers for effective application in mapping of genes agro-economic traits including biotic stress resistance in various crops, vis-a-vis their employment in marker assisted selection (MAS) programs (Gupta et al., 2006a; 2006b; Li et al., 2008; Dianese et al., 2010; Srivastava et al., 2012). However, there is no report available on development of SCAR marker and its application in pigeon-pea. In this communication the pattern of inheritance of genetic elements contributing plume moth resistance was explained using interspecific mapping population involving C. cajan (acc. ICP-26) and C. scarabaeoides (acc. ICPW-94), and development of a RAPD derived SCAR marker linked with plume moth resistance is reported. The pods of individual parents and 116 F2 progenies derived from an interspecific cross of C. cajan (acc. ICP-26) as female parent and C. scarabaeoides (acc. ICPW-94) as male parent were examined for the presence of exit holes on pod surface at every 7 d. The evaluation entries for the F2 progenies were then scored on interaction phenotype (IP) scale of 1-9 (Mishra et al., 2013). Simultaneously, the laboratory based antibiosis assay using artificial diet (Armes et al., 1992) was performed to ascertain the survival and development of neonate larvae on fresh pods and lyophilized pod powder based diet (Mishra, 2013). On the basis of larval growth (larval weight) at the 10th day the genotypes were assigned with IP score on 1-9 scale as 1 = ≤ 5.0 mg increment in larval weight, 2 = > 5.1 mg and ≤ 10.0 mg increment in larval weight, 3 = > 10.1 mg and ≤ 15.0 mg increment in larval weight, 4 = > 15.1 mg and ≤ 20.0 mg increment in larval weight, 5 = > 20.1 mg and ≤ 25.0 mg increment in larval weight, 6 = > 25.1 mg and ≤ 30.0 mg increment in larval weight, 7 = > 30.1 mg and ≤ 35.0 mg increment in larval weight, 8 = > 35.1 mg and ≤ 40.0 mg increment in larval weight, and 9 = > 49.1 mg and above increment in larval weight. Similar to this 12 BC1F1 plants and 50 progenies of F3 families were assessed for host resistance to plume moth in both field condition and laboratory based antibiosis assay, and all the progenies of 78 F3 families were assessed for its reaction to plume moth under field condition only. Genomic DNA was isolated from young leaves of both the parents, 116 F2 progenies, 12 BC1F1 lines and 50 F3 progenies using modified CTAB protocol as described by Sivaramakrishnan et al. (1997), and were diluted to a final concentration of 20 ng L-1 using T10E1 (10 mM Tris-HCl and 1 mM EDTA) buffer for DNA marker analysis. The diluted genomic DNA of 20 F2 lines identified on the basis of field resistance vis-α-vis antibiosis response were used to prepare two bulks, resistant bulk (RB; consisting of 10 plume moth resistant F2 plants with score 1) and susceptible bulk (SB; consisting of 10 plume moth susceptible F2 plants with score 8 and 9). A total of 143 synthesized decamer primers (Integrated DNA Technologies, Leuven, Belgium) showing parental polymorphism were used in bulked segregant analysis. The PCR amplification were carried out in a reaction volume of 25 μL containing, 10X assay buffer, 1.5 mM MgCl2, 200 μM of each dNTP, 0.3 μM primer, 1.0 units Taq DNA polymerase (Bangalore Genei Pvt. Ltd., Bengaluru, Karnataka, India). PCR amplification was carried out in a thermal cycler (Veriti-96; Applied Biosystems, Foster City, California, USA) under the following condition: initial denaturation at 94 °C for 5 min, followed by 45 cycles of denaturation at 94 °C for 1 min, annealing at 37 °C for 1 min, extension at 72 °C for 2 min and final extension at 72 °C for 5 min. The amplified products were separated in 1.4% (w/v) agarose gel and visualized on the gel documentation system (FireReader System, UVITEC, Cambridge, UK) and photographed. Of the 143 random primers, one primer OPA09 (5'-GGGTAACGCC-3') could amplify a specific band of about 910 bp in both resistant parent (C. scarabaeoides acc. ICPW-94) and resistant bulk which demonstrated its apparent association with plume moth resistance (Figure 1). The same reaction using primer OPA09 was performed in two other thermal cyclers (Mastercycler Pro, Eppendorf, Hamburg, Germany; My Cycler, Biorad, Hercules, California, USA) and reproducibility of the specific band verified. Further, the primer OPA09 was used for single plant analysis of 116 F2 progenies, and progenies having 'ICP-26' allele were scored as 'A' and those possessing 'ICPW-94' alleles were identified as 'B'. Recombination events between the locus conferring plume moth resistance and RAPD marker was computed and converted to map distance using Kosambi map function (Kosambi, 1943). Subsequently RAPD fragment was cloned using pTZ57R/T vector system using InsTAclone PCR cloning kit (Fermentas, Thermo Scientific, Waltham, Massachusetts, USA), and the plasmid DNA of recombinant clones were subjected amplification using S0100 and S0101 as forward and reverse primer as per the information available in cloning kit. The amplified fragment was sequenced in ABI-3500 Genetic Analyzer (Applied Biosystems, USA) and the fragment size was estimated to be 942 bp. Accordingly the SCAR marker is named as SCOPA09942. Four pairs of forward and reverse primers were designed using web based software (Primer-BLAST, NCBI, Bethesda, Maryland, USA) using the border sequence cloned fragment, and one pair with primer sequences were: SCOPA09942F: 5'-GGGTAACGCCAAACCATAGA-3' and SCOPA09942R: 5'-GGTAACGCCGAAGCTCTCT-3' successfully amplified the target fragment. The components of the PCR reaction were the same as that described for RAPD analysis, except exclusion of MgCl2 and enhanced primer concentration (10 μM). The optimized thermal cyclic condition was: initial denaturation at 94 °C for 5 min, followed by 30 cycles of denaturation at 94 °C for 30 s, annealing at 60 °C for 30 s, extension at 72 °C for 1 min and final extension at 72 °C for 2 min. The SCAR primers succeeded in amplifying a single fragment in the resistant parent and resistant bulk identical to OPA09910. The segregation of SCAR marker in F2 population was analyzed and its linkage relationship with the locus conferring plume moth resistance was estimated. The 942 bp sequence was subjected to BLAST analysis using genome sequence of pigeon-pea (Varshney et al., 2012; Singh et al., 2012) to identify its position. Figure 1. Bulked segregant analysis of plume moth resistance using RAPD primer OPA09 (a) and SCAR marker SCOPA09942 specific primers (b); M: 250 bp step up ladder as molecular weight marker. Cc: susceptible parent (Cajanus cajan acc. ICP-26); SB: susceptible bulk. The frequency distribution in the 116 F2 progenies, on the basis of their respective IP score gave good fit to 3:1 for plume moth resistance (χ2 = 1.655 and p-value = 0.198), indicating single dominant gene control for plume moth resistance. In F3 generation, the segregation pattern of 78 F3 families for plume moth reaction was good fit for 1 (18 non segregating resistant): 2 (46 segregating): 1 (14 non segregating susceptible) ratio (χ2 = 2.923, p-value = 0.403), evidencing monogenic segregation pattern and single dominant gene action, as reported for pod borer resistance (Verulkar et al., 1997; Aruna et al., 2005; Mishra et al., 2013) and Fusarium wilt resistance (Kotresh et al., 2006) in pigeon-pea. This monogenic segregation for plume moth resistance was further established by 1:1 segregation pattern at BC1F1 (χ2 = 0.332, p-value = 0.564) lines. Among the 143 RAPD primers distinguished the parental lines, one RAPD primer (OPA09) differentiated the resistant bulk from the susceptible bulk during BSA (Figure 1a) and generated a putative marker OPA09910 associated with plume moth resistance in coupling phase. Single plant analysis of OPA09910 among 116 F2 progenies revealed expected 3:1 segregation (χ2 = 2.113 and p-value = 0.146). Linkage analysis using segregation data showed PPM1 locus was linked to OPA09 910 at 12.7 cM (recombination fraction 0.121). Only few reports pertaining to linkage association of RAPD markers with Fusarium wilt resistance (Kotresh et al., 2006), plant type (Dhanasekar et al., 2010), and pod borer resistance (Mishra et al., 2013) were available in pigeon-pea. For precision and accuracy, the marker OPA09910 was converted into SCAR marker named SCOPA09942, and size of the amplified fragment is estimated to be 942 bp with 41.3% GC content (GenBank accession: KJ806291.1; Figure 2a). BLAST analysis with pigeon-pea genome sequence revealed its position on CcLG02, Scafseq.LG_ V5.0fa: 25623599-25622679 bp (Varshney et al., 2012) and contig 01597, AFSP01.fsa.1: 8557-7640 bp (Singh et al., 2012) with more than 99% homology for 2-922 bp sequence of the marker. This type of comparative genome analysis was first used for chromosome localization of blast resistance gene in rice (Sharma et al. 2005), and later on used for various traits related to biotic stress in several crops viz. aphid resistance in sorghum (Chang et al., 2012) and black rot resistance in Brassica oleracea (Saha et al. 2014). Out of four primer pairs designed on the basis of flanking sequence of cloned fragment, one primer pair (forward: SCOPA09942F and reverse: SCOPA09942R) amplified the expected fragment of 941 bp (Figure 1b) in both C. scarabaeoides (acc. ICPW-94) and the resistant bulk (Figure 1b). Thus, SCOPA09942 behave as coupling phase specific dominant SCAR marker. Amplification pattern of SCOPA09942 among the F2 progenies is almost similar to that OPA09910 barring two F2 lines with χ2 = 2.251 and p-value = 0.133 (Figure 2b). Linkage analysis OPA09910, SCOPA09942, and IP score for plume moth reaction revealed its position 10.3 cM (0.102 rf) and 1.2 cM (0.012 rf) away from locus PPM1 and OPA09910, respectively. The screening efficiency of this SCAR marker has been estimated to be 66.37%, 91.66%, and 76.0% in the 116 F2, 12 BC1F1, and 50 F3 lines, respectively (Table 1). This medium-high screening efficiency of the SCAR marker might be attributed to the heterozygous nature of the progenies due to recombination events experienced by the population tested (Chen et al., 2007) vis-a-vis differential expression of target gene in the progenies with respect to the occurrence of this marker (Srivastava et al., 2012). Even this marker may be genomic fragment of a specific gene that regulates the expression plume moth resistance, either wholly or partially. However, these findings substantiates the applicability of this coupling phase SCAR marker (SCOPA09942) in future breeding programs pertaining to plume moth resistance in pigeon-pea either individually or coupled with a repulsion phase marker for high precisions. Figure 2. 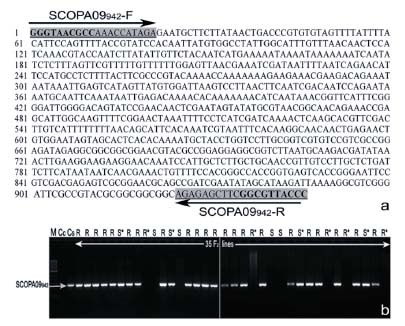 Sequence information of the fragment OPA-O9910 (942bp) and the binding site of the SCAR primers SCOPAO9942-F and SCOPAO9942-R (a); Segregation of SCAR marker SCOPA09942 in a set of 35 F2 progenies (b). RB: resistant bulk; Cc: susceptible parent (Cajanus cajan acc. ICP-26), SB: susceptible bulk. *Reaction to plume moth (R: resistant and S: susceptible) was indicated on top of the lanes of 35 F2 lines with deviations. Table 1. Screening efficiency of SCOPA09942 marker in F2 population, BC 1 F 1, and F 3 progenies. The findings strongly evidenced that OPA09910 and SCOPA09942 were closely associated with the locus conferring plume moth resistance in pigeon-pea and the coupling phase SCAR marker SCOPA09942 will provide ample scope for both screening of the existing germplasm as well as marker aided introgression of the plume moth resistant allele into cultivated genetic background of pigeon-pea. The authors are highly grateful to the Department of Biotechnology, and Department of Science and Technology, Govt. of India, New Delhi, for financial assistance though R&D projects (F. nr BT/PR13468/ AGR/02/702/2010 of DBT & F nr SR/FT/LS-92/2009 of DST) to the corresponding author (JP).